Recently, the media watch organization FAIR had a novel idea for a stinging response to Rush Limbaugh’s reign of error: the truth. The Way Things Aren’t documents and corrects over 100 whoppers told by The Lyin’ King, pitting Limbaugh versus Reality in areas ranging from American history to the environment, health care to rock and roll. It also has features such as “Limbaugh versus Limbaugh” with examples of Limbaugh contradicting himself, cartoons by Garry Trudeau and Tom Tomorrow, seven things you can do about Rush Limbaugh, a postcard to mail to the talk show host about his Limbecile statements, and a foreword to Limbaughland by Molly Ivins that is as scary as it is funny. 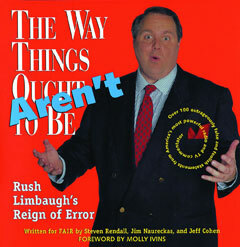 If you know a dittohead who needs deprogramming or if you want to see for yourself how far out on a Limbaugh Rush really is, pick up a copy of The Way Things Aren’t—it’s cheaper than The Way Things Ought to Be, and it’s been fact checked.